LAKEVIEW — Anna Steinberg grew up in an all-female Ukrainian immigrant household where Russian fashion reigned — Versace, high heels, short skirts, blue eyeshadow. Then, she fell in love with a Modern Orthodox Jewish man she met on JDate, a Jewish dating website. But when it came time for the wedding, she had a problem: All the dresses fit for a modest Jewish wedding looked like white potato sacks. "I have curves," she said. "I wanted to show them off." Steinberg, 29, wanted to help brides who need modesty, fashion and a good fit for their weddings after struggling to find her own gown, she said. So she decided to start a custom wedding gown company: Stasia Modest Couture. Her goal for the dresses, which she'll start selling Monday, is to make the modest bride's "dreams come true," with as little stress as possible, Steinberg said. "I just want to be able to give brides that modest look," she said. "Adhere to religious requirements, but also make them feel beautiful, that their unique style is being represented." It's not just Modern Orthodox weddings. Muslim, Mormon and some Catholic brides also must cover up. But walk into a place like David's Bridal, and it's mostly strapless, sleeveless or backless gowns showing too much skin for religious ceremonies, Steinberg said. Steinberg ultimately ordered her own dress from Mormon wedding gown site Latter Day Bride and Prom but spent many stressful hours and hundreds of dollars on alterations. She liked it, but it didn't fit entirely right, she said. "Religious brides don't have it easy at all," Steinberg said. "I want to create a bridge through all these religions." 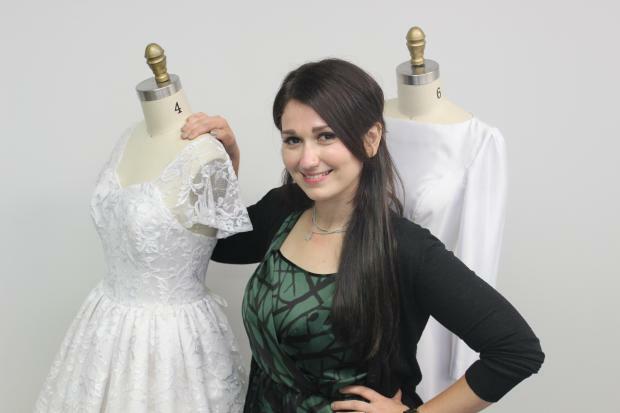 Her new online-based company allows brides to choose bodices, sleeves and skirts fit to their needs. Dresses will be created to their measurements in a production room in Lakeview, shipping four to six weeks from the order date. Women living in Chicago can visit the storefront at 3617 N. Ashland Ave. to be measured, too. Regardless of proximity, brides will be updated every week or every other week on the status of their gowns. Dresses will cost between $1,500 and $2,900, depending on which design the bride chooses. Steinberg designed all the pieces herself. She's always been interested in fashion and attended the Fashion Institute of Technology in New York for a semester of college before deciding she disliked New York. She transferred to DePaul to study psychology and earned an MBA at Loyola recently. She came up with the idea for Stasia in business school. A lead designer and five other people will be working at the company, and eventually she hopes to open a boutique. "I’m here to make brides' dreams come true," she said, "and relieve this enormous stress that comes with weddings."